Q&A — The P-39 — was it really a bad design? The basic P-39 design was indeed capable of improvement, and the evidence is the P-63A King Cobra. I once spoke with someone who flew them, and he told me how they used to jump P-51s as they were climbing over Fort Walton Beach and they always used to beat them. He had been put on alert to ship out, with P-63s, to defend the B-29 bases in China when they were set up in 1944, but that ended up fizzling out as the Japanese took the offensive on the ground there and the bombers shifted to the Marianas. Russians were able to use P-39s well, not so much for ground attack as is often asserted in English-language sources, but because they were able to work out tactics that took advantages of its strengths and minimized its limitations. For example, while the US found the P-39’s rate of climb a problem when climbing to intercept Japanese attackers over Guadalcanal in 42-43, the Soviets were generally on the offensive when they started using large numbers of P-39s and did not have to worry too much about high altitude attackers (one reason their lend-lease Spitfire IXs saw little if any combat). My Dad was a Tuskegee Airman. He flew the P-51B and P-51D in combat. He came in as a replacement pilot late in the war and flew a plane named “Lucifer Jr” along with another pilot, since he was not assigned his own plane. I am still looking around for pictures of “Lucifer Jr” but with no luck. I once asked my Dad about the P-39 which he flew in Advanced Pilot Training. He said something interesting. He said if the P-39 had been equipped with a better engine, like the Merlin, and a high performace supercharger it would have been a World-Beater. Curious. I believe the definitive story of the P-39 has yet to be told. 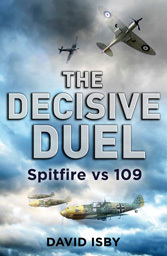 I think it is an interesting story of war, world politics, inter-service rivalry, and technology. I am sure some of your Russian friends could shed new light on the history of the P-39. What do you think?